We are the leaders in airborne video imaging, with Securaplane cameras in service on business jets and large commercial aircraft. Applications include: ground maneuvering during taxi operations, in-flight entertainment, military aircraft refueling, flight crew monitoring and observation of aircraft control surfaces, and cabin & external security . Securaplane has a wider product range and more installation experience than any other manufacturer. Applications include: Airbus A320 series/A310/A330/A340/A380, nearly all Boeing commercial aircraft models in production, McDonnell-Douglas legacy aircraft such as the DC-9/MD-80, DC-10/MD-11, all Gulfstream models, Falcon 50/900/2000/7x, Bombardier Global and Challenger series, Cessna Citation series and many others. 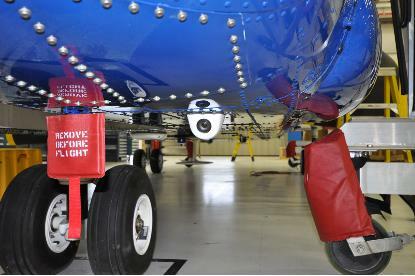 The first external camera system was developed by Securaplane to enhance an aircraft security system. This initial system consisted of a ruggedized monochrome camera unit installed in the nose-gear. It also worked as a ground taxi aid. The next development was a low-profile aerodynamnic external camera system suitable for in-flight entertainment, safety, and security applications. With this suite, Securaplane rapidly became the leading supplier of airborne video cameras for business jets.